Get Out is Jordan Peele’s feature film debut and let’s start by saying what a way to debut. This is a film about Chris a black photographer who is taking the plunge and meeting his white girlfriend’s parents for the first time. Which on a normal day would still be a nervous situation but in this case things just turn scary. Reflecting social constructs right from the off, this film tackles Racism and Social Class in a brutal hyper real way, but still mirroring real life events and situations. The tone of the film is set from the opening sequence. A black man is walking through a suburban neighbourhood when a white sports car pulls up blaring the song “Run Rabbit Run Rabbit” – he tries to ignore it but as the car stalks him he turns to confront the driver and is jumped, knocked out and put in the boot of the car by a masked figure. Powerful stuff in the opening five minutes and it doesn’t let up there. The whole time I found myself sitting on the edge of my seat wanting to know what was going to happen next, wondering if it was real or not. So in true film fashion the white family live in a very white upper middle class neighbourhood – the kind you see hosting dinner parties on the lawn by the lake. Chris turns up and instantly feels worried, like the social norm would predict. Are her parents old-fashioned, will they accept a black boyfriend. But then again in true Hollywood fashion the parents try to be cool – the dad greeting Chris with “My Man” and voicing his opinions on how much he liked Obama as President. Again these can be seen as normal things that happen. We’ve all said something like that before to try to relate or show we accept and understand. Then we introduce hypnotism – the mother is a private therapist who obviously has her own office in the house. To begin with it’s just excused and laughed off. She tries to offer to help Chris quit smoking with her method, but he polity denies the offer. She finally gets a chance to do it after cornering him one night and subtlety doing it to him. From then on, Chris is put into a struggle. To work out if that was real, if everything is what it should be and then paranoia sets it and he starts to question and look at everything differently. That is where I am going to stop with the plot. All I will say is things get dark, things get tense and things get violent. Keep an eye out for the Deer Head as well. Good luck. Peele does something really clever and manages to get a dose of humour into this film in the form of Chris’ best friend Rod played by Lil Rel Howery. He is the typical black comic relief that helps bring the film back towards the realms of reality. It’s done almost like Rod is watching this film following Chris the character rather than Chris his friend. Until the end where the worlds collide and like I said makes things even more realistic. 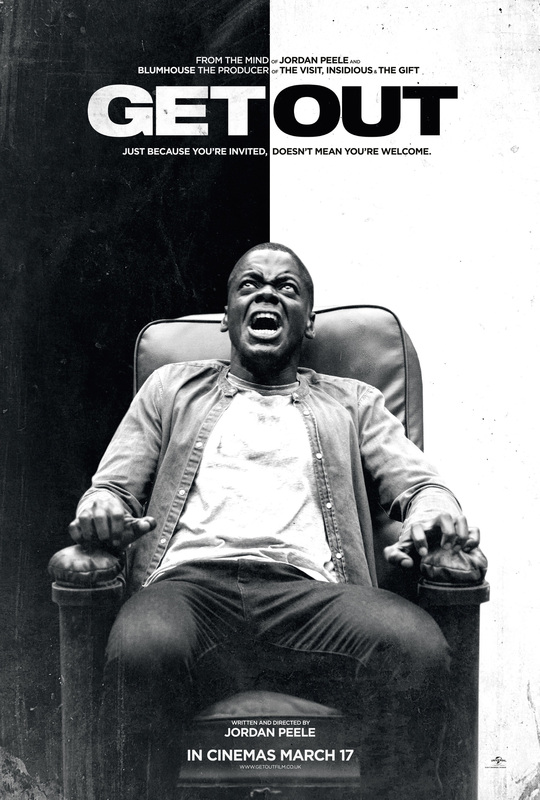 I am not sure how Jordan Peele did it and I really hope he doesn’t go the same was as M Night Shyamalan – starting on a high and slowly burning out but everything Peele put into this film works, the acting from all the cast is brilliant. Questionable, strange and nervous. Everyone portrays what they need to in such a convincing way that at the end you are with Chris, scarred and afraid of everything going on. The score and music choices are equalling as tense and frightening. Bringing you closer to the edge of your seat with every key change and obviously the theme – such a hot topic and social taboo to talk about is taken and ran with in a brutal honest display of real life culture and social constructs. Overall I left the cinema very happy and proud of the film. Which I found I hadn’t really done in a while. It was brilliant, so good, I genuinely can’t stop thinking or talking about this film. There is a few jumps that you just don’t see coming, a bit of blood, gore and just an overall spine tingling feeling of nerves. GET OUT! GO AND SEE THIS FILM. ← What To Do Next?